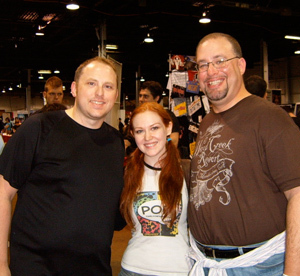 Ah, Wizard World Chicago 2010 was a lot of fun. I had the pleasure of hanging out with Trevor Mueller, Russell Lissau, Scott Heinowski, Steve Wallace and John Bivens. Seriously cool guys and they were a lot of fun to hang out with. There was much laughter, Jack and take out food. It’s the first time that I exhibited on a Thursday and I was surprised that there were buyers! I figured it’d be a ghost town but there was some light traffic. 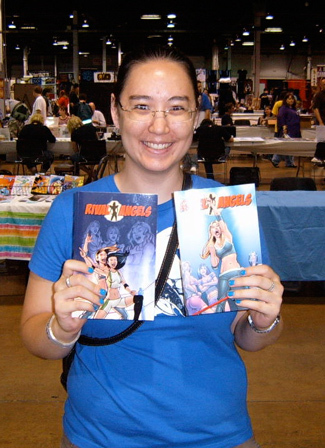 Friday was the best day for selling Rival Angels books though it was a lot busier on Saturday. Sunday started off hopping mad and I got to speak to Mike (OnyxSparrow) and Cori, a fan of Shadowgirls, The Dreamer and Rival Angels (clearly some great taste there). I also got to speak with other regular readers like jabberwocky and Chris C! I always love speaking with readers, getting feedback and just shooting the breeze. Speaking of Shadowgirls and the Dreamer, I got this super sweet sketch of Sabrina from the super awesome, Jenny Frison. I hope she keeps her pimp hand strong for when she accepts her Harvey Award this Saturday for being nominated for her covers on The Dreamer. I was happy to see Dave Reynolds make a surprise appearance to the show and catch up a little bit. It was fitting to meet D-Rey there after seeing D-Rod at C2E2. 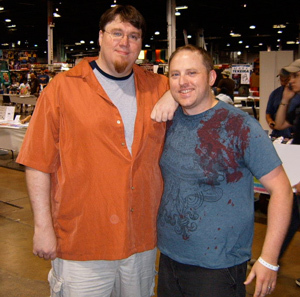 Trevor and I also did a quick little interview for Bleeding Cool.com. Check out the video interview here. I also got to meet friends of mine like Michelle and her boyfriend. 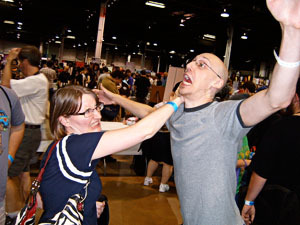 She picked up a copy of Rival Angels and then chopped Trevor down like a tree. W00t! Turns out that Russell and I share a pal in the ever popular and talented Kristen Allen. Now my WUMB collection is complete after getting pictures previously with Carly and Spidey. I did some fun commissions at the show and here are some fun ones I did of Cheerleader Melissa (for ChrisC) and Black Canary. And of course, the cosplayers. Can you have a convention show in this day and age without these comic costume worshipers? Damn, I missed a good show! All them awesome webular peoples AND smokin’ hot cosplayers? I’m totally going the next Chicago con. FUH SERIOUS. We should be table neighbors or share a table! XD Yes, more cosplayers than you could shake a stick at. is that R2d2, really a mechanical robot in it? or just a doll? 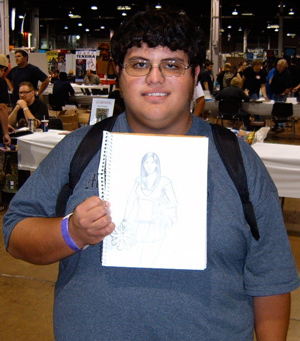 Who’s that handsome fellow with the Cheerleader Melissa comission? A seriously fun time, my friend. Looking forward to the next show! See Chicago is just a rocking town man 🙂 Glad you had a blast because that looked like serious fun. 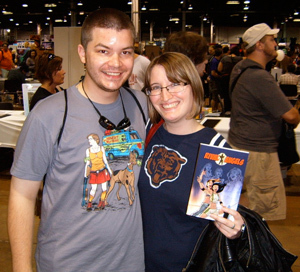 Are you going to the next C2E2 / Wizard World Chicago in 2011? Chicago is a very cool town and I’m glad to have Rival Angels set there. Yes to both. Artist Alley for sure for WWC, and keeping my fingers crossed for C2E2.